and slightly exhausted at the end. This week, Winning Wednesday is a book I read last year that I want to share with someone – “A Thousand Splendid Suns” by Khaled Hosseini (he also wrote The Kite Runner) It is a good book and I experienced another culture in a way I hadn’t before and I was exhausted at the end because I wanted to help every woman in Afghanistan. I wanted to fix their situation! Not that I think their world should look like mine, but I was sad at the centuries of traditions those women are burdened with and the degrading treatment and/or abuse that is a part of too many of their lives. 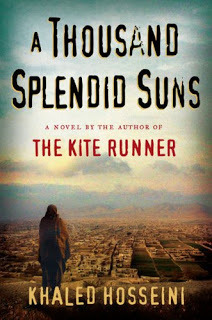 Reading “A Thousand Splendid Suns” opened my eyes to other world, taking my view beyond the pictures on the evening news. And if I allow it, I’ll be more compassionate because I will better understand individuals with a different life than my own. Individuals created by the same creator as me – and in his image, just like I am. Do you want to read it? Leave your name below for a chance to win it. Also, I would love to hear your thoughts about how far one ‘drop’ can ripple. Have you seen that in your own life or someone elses? Sounds very interesting. Women of different cultures have been on my heart letely. Sounds like something I would like to read. I always read the same stuff and I feel that I should read about life and get to know what it going on. How far one drop can ripple…ponder this. I have a heart for victims of human trafficking. Over 27 million victims worldwide, with many experts saying that is grossly understimated. Mind boggling, isn't it? Almost too much to even tackle. BUT….if I help free 2, who are then empowered to help 2 more, who are then empowered to help 2 more….in less than 2 months trafficking would be eliminated. Of course, the process actually takes years, but it proves how a little really goes SO far. Bless you Janet!!!! Gayle – agree with you about the human trafficking. I find myself not even able to think about it at times, because its so overwhelming. Interesting that 2 by 2 by 2 could equal such a major effect in so short a time. That does make a big problem look more manageable. Don't pick me…have it and already read it. I wholeheartedly agree. Life-changing and thought-provoking. Just like his first, but very different too. 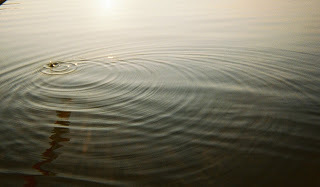 As far as the ripple…this summer, I met a man who was affected 20 years ago by someone's writing, and to this day it affects his daily life and ministry. Profound. Best part of my summer! This one has been on my "to read" list for a while…..I'm feeling lucky!! .there are so many ways a drop of water has effected my life….the biggest one was when I was hospitalized for 23 days. I developed a massive blockage in intestines that was beginning to poison my body. I was scheduled for emergency surgery which my doctor told me would be very very risky and that I should call my family. I called Jon first…that was the drop of water. He was on his way to church when I called. He told Pastor John what was happening. Then the ripple began….Pastor John asked everyone to pray for me. (I didn't know the whole church was praying for me long after Jon arrived) When Jon got to the hospital, they took me for one last ultrasound to check where the huge blockage was and it was gone! Nothing there! The surgeon was astounded but I just smiled at him and said "Believe…..just believe in miracles…..God knew my needs and He worked a miracle" The surgeon just shook his head and said "I've never seen this happen before….maybe it's time to start believing". Yeah!! To this day I pray for the doctor that he has learned to believe in and trust God, that miracles DO happen.